Discover how peace and tranquility have been tapped through the personal stories of ordinary people, ordinary gardens, and extraordinary spaces. 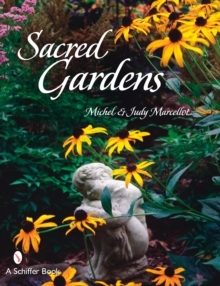 As professional horticulturalists, as husband and wife, and now as authors, Michel and Judy Marcellot explore motivations to garden for peace, for balance, for relaxation, for contemplation, and to memorialize loved ones. Above all, they find joy expressed within and through gardening. Personal stories show how the simple act of gardening changed lives and individuals. The authors chronicle their own paths from naive and idealistic, back-to-the-earth entrepreneurs who wanted to "be of service to the planet, and have a good time doing it," to respected horticulturists and sought after speakers who still embody the same ideals as when they started out. Examples illustrate varied elements of sacred sites and suggest ways readers might create the sacred in their own gardens. Read on and see how ordinary gardeners can attain their own backyard bliss.